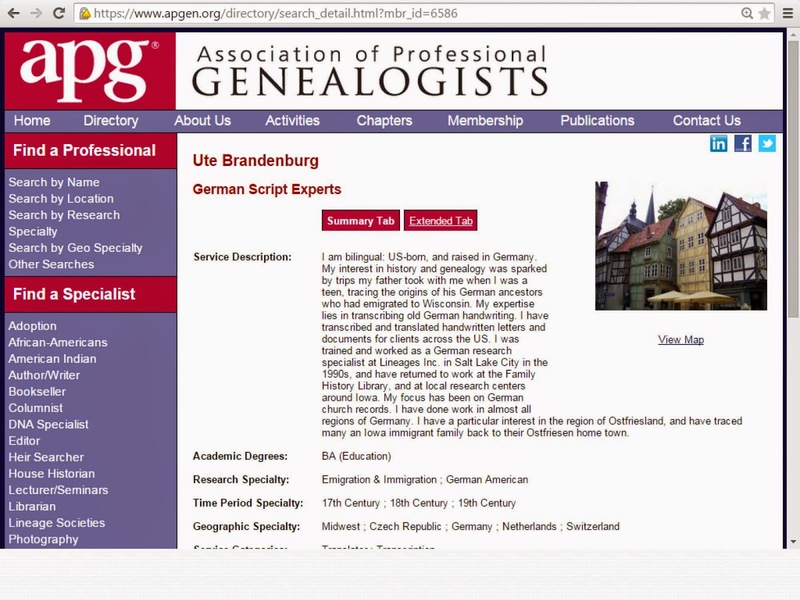 AncestorPuzzles.com: German Ancestors Part 3- Lost in Translation? 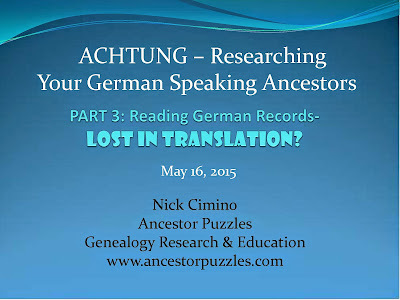 The third presentation in my series on German family history research was presented this last Saturday. I want to thank my partners at the Bay Area Genealogical Society (BAGS) who have helped me present this series of programs. I especially want to thank Kim Zrubek, BAGS Program VP and Bob Wegner, BAGS Registrar who have been instrumental in organizing this Special Interest Group. We will be offering more German programs in the fall. 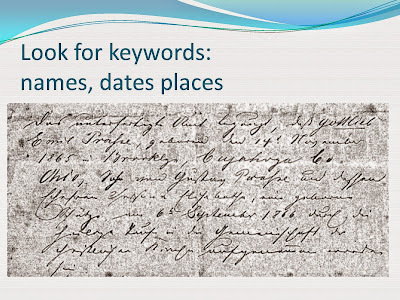 If you are interested in more of my presentations and blogs on German genealogy, type the word German in the search box in the right hand column and you will see a list of all of my German topics. 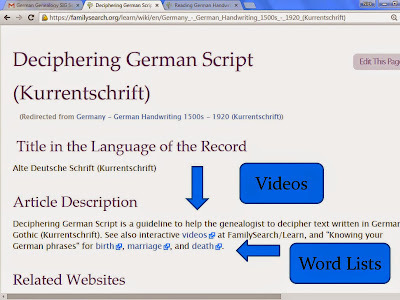 This presentation gives a few tips on how to translate German records when you do not actually speak German. 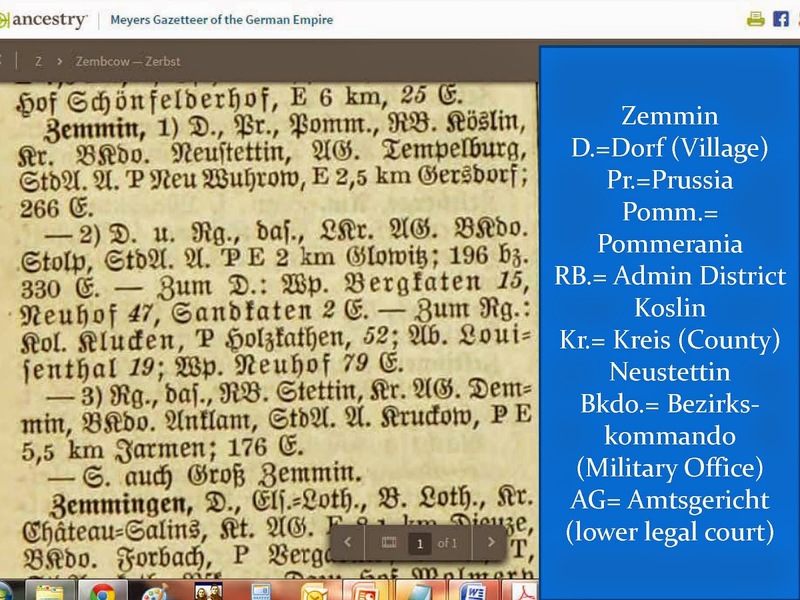 One of the attendees told me that she had a cousin in Germany that was unable to read the old German records. 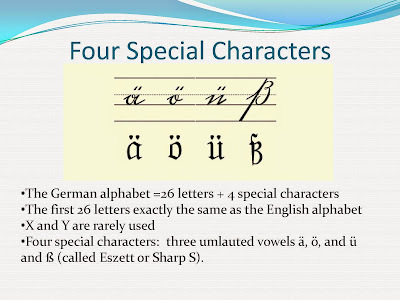 That is because prior to the 1940s the Germans used a unique alphabet that varies somewhat from the Roman alphabet used in Western Europe and the Americas. The name for this unique alphabet is Kurrenschrift. The following page from the FamilySearch Wiki includes links to several helpful videos and some word lists that simplify the process of translation of old German records. 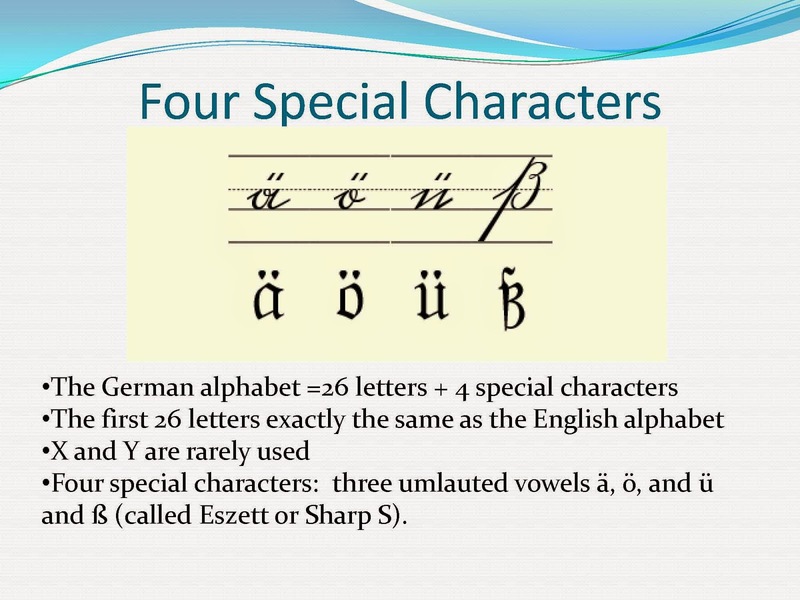 The German lower case letters are pretty similar to our Roman alphabet. 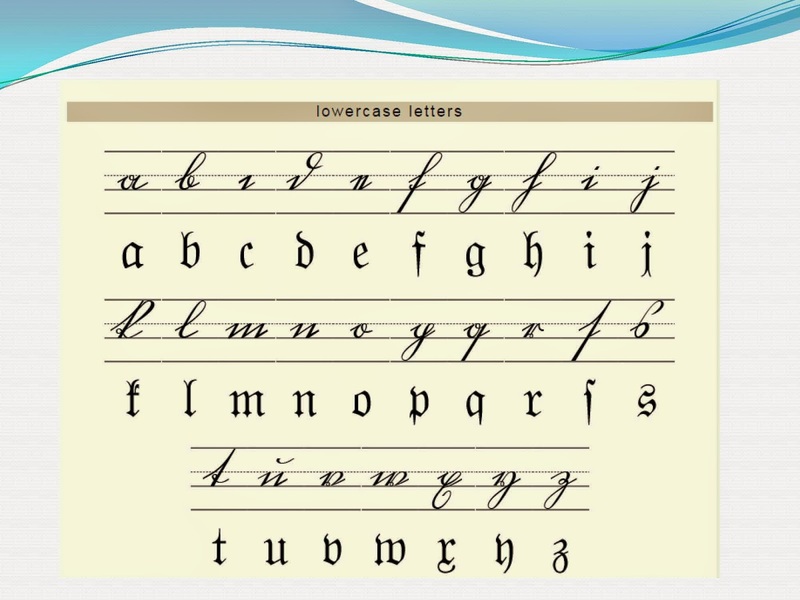 The lowercase letter chart has 27 letters with the addition of the Eszett or Sharp S. These charts were obtained from the Paleography Tutorials at the Brigham Young University website. 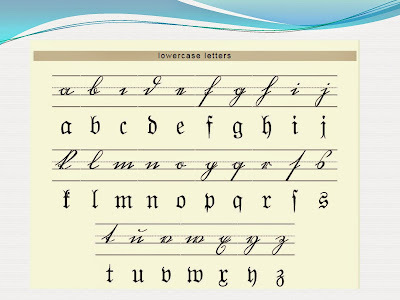 This website offers guidance in the deciphering of documents written in handwriting styles or alphabets no longer in general use. 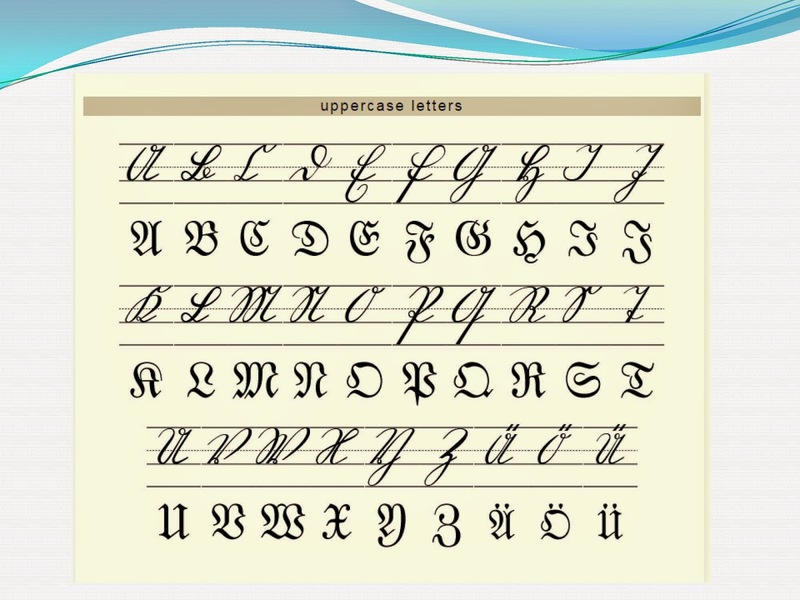 It concentrates on alphabets used between 1500 and 1800 in western Europe. Currently it offers instruction in English, German, Dutch, Italian, French, Spanish, and Portuguese; Latin and eastern European languages will be added in the future. Kurrentschrift has four special characters including three umlauted vowels and the Eszett or Sharp S that are in addition to the 26 letters that we know. The capital letters are the most problematic for me. 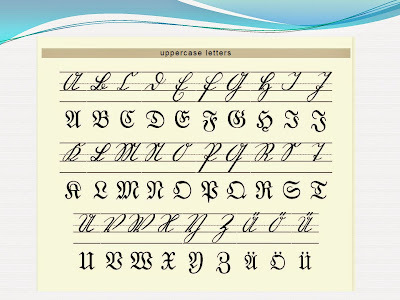 Take a look at this chart of uppercase letters. You will notice that the differences between the "A" and the "U" are very subtle. It takes a little practice to discern the uppercase letters. It is complicated by the fact there were various forms of "Gothic script" used by different publishers. 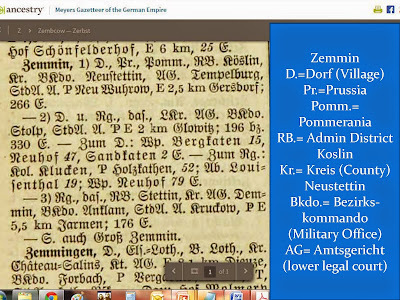 For example, a dictionary of German placenames known in English as Meyers Gazetteer of the German Empire requires a translating guide all of its own. I have one written by Fay S. Dearden entitled "Understanding Meyers Orts" which I used to translate the various jurisdictions for the village of Zemmin in Pommerania. See the example below. 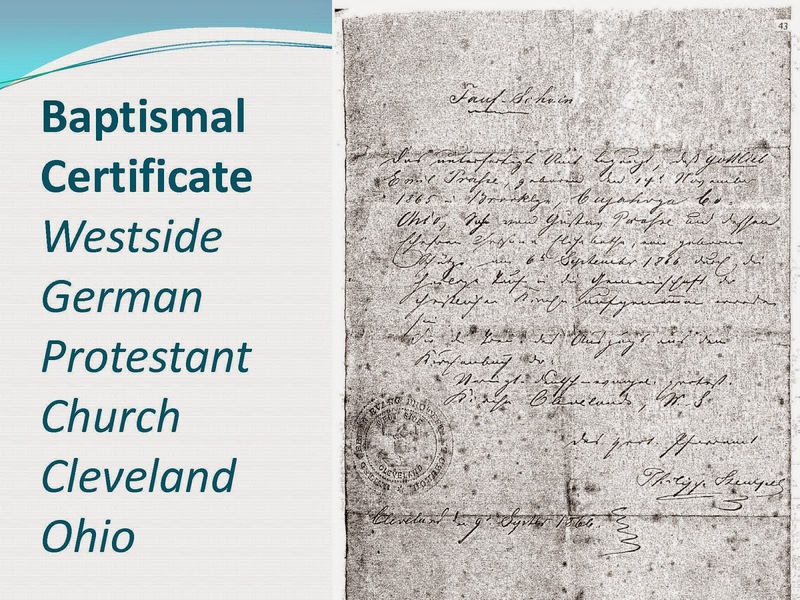 This baptismal certificate was written in German by the Rev. Phillip Stemple of the Westside German Protestant Church in Cleveland, Ohio and references the original church book from which it was taken. German immigrants attended German speaking churches in the United States. The records of these churches often hold the key to the German hometown of your immigrant ancestors. 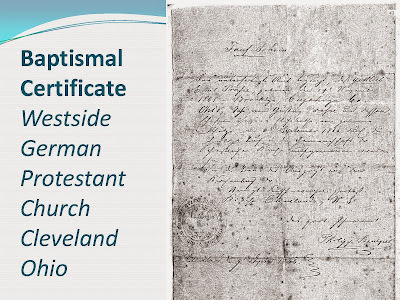 This baptismal certificate was preserved and indexed by the Western Reserve Historical Society in Cleveland. Church records for our immigrant ancestors sometimes have been microfilmed and can be accessed through a Family History Center. Often you will be required to search for these records in archives or historical societies of cities, counties and churches. One good approach is to look for the capitalized names and places first. For example, you can see Gottlieb Emil Prasse in the first and second lines and Brooklyn, Cuyahoga Co., Ohio in the third and fourth lines. 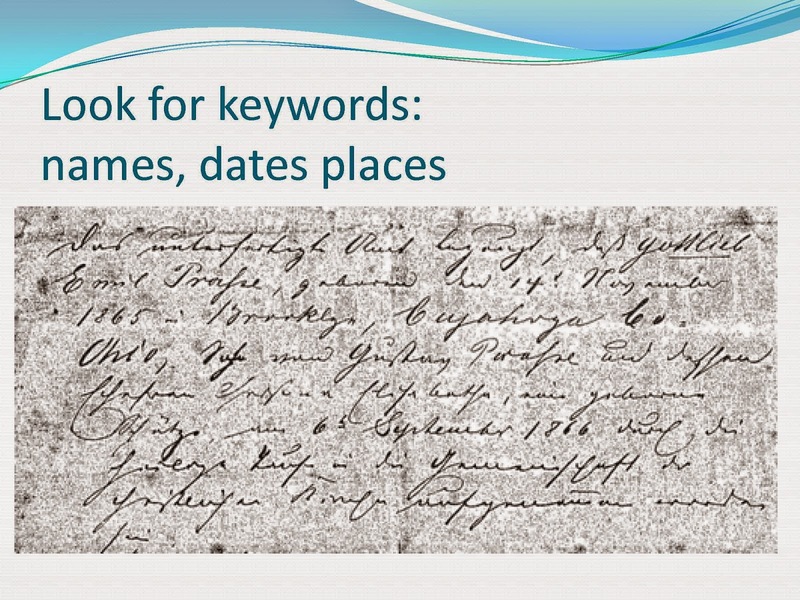 The keyword "geboren" or "born" is prior to the date of 14 November 1865. 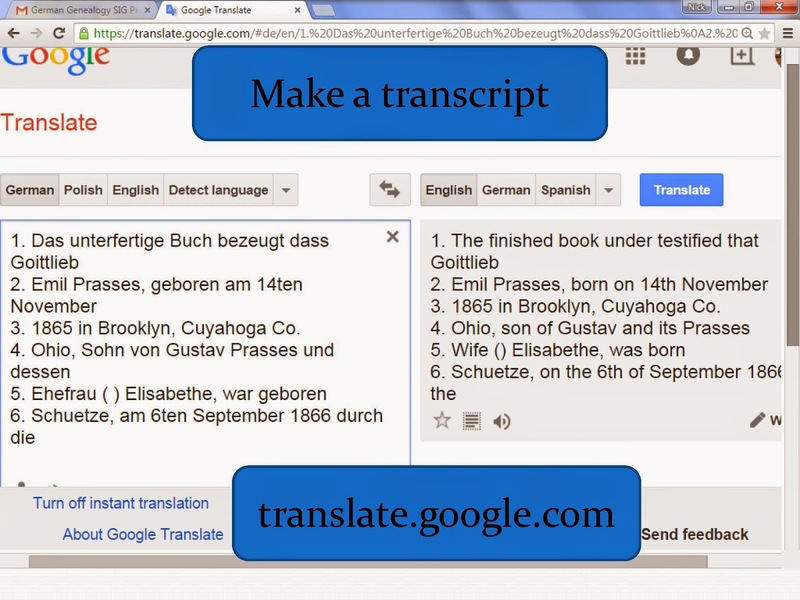 Another approach to translation of German records is to make a transcript of the German and use Google translate to get the English version. This results in a literal translation that can be somewhat awkward but for genealogical purposes you get the essential facts as you can see in this example below. If you prefer to get help with translations, I recommend that you visit the website of the Association of Professional Genealogists. You can find a professional with expertise in reading German records that will be happy to help you. 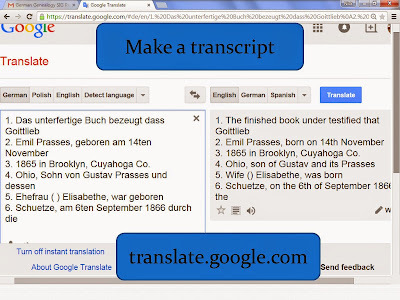 Send the genealogist a copy of the record that you are attempting to translate and ask for an estimate to translate the document for you. I call upon my peers in APG quite often when I am researching in a distant locale or am having difficulty with a specialized record. 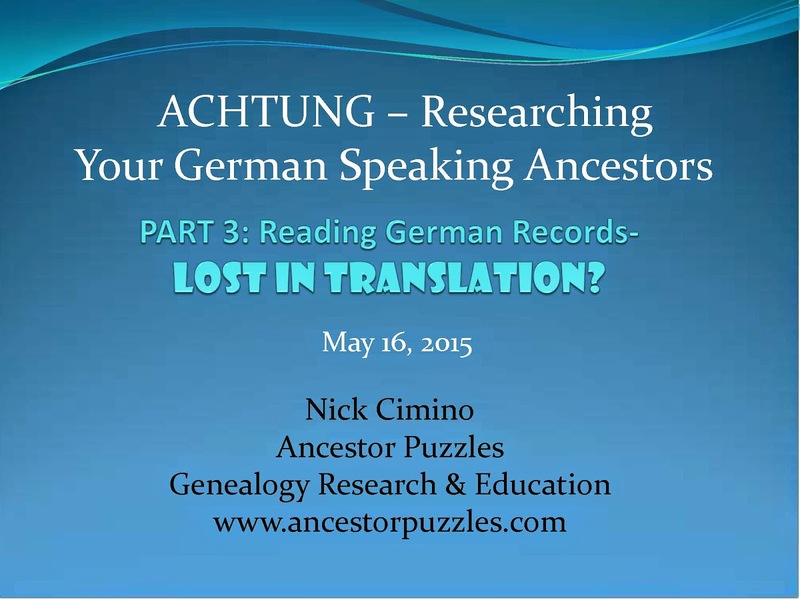 My full presentation offers many more tips on how to translate and find resources to assist you in discovering your German heritage.